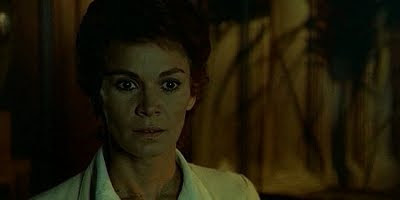 An interpretor called Alice, Florinda Bolkan, is shocked to discover that she has 'lost' three days of her life. A handful of cryptic clues leads her to the off-season resort of Garma, where, sure enough, people seem to recognise her - only as 'Nicole'. As Alice tries to solve the riddle of what Nicole, or possibly herself, was doing there for three days, a scene from a half-remembered film plays over in her mind, wherein an astronaut is left on the moon to die by Klaus Kinski's 'Dr Blackman'. This odd, haunting little film from The Fifth Cord director Luigi Bazzoni and an uncredited Mario Fanelli contains none of the excesses one tends to expect with Italian mystery thrillers, being instead a slow-moving piece with an unusually disconcerting atmosphere. Bolkan's sensitive, nuanced performance carries this meditation on loneliness and alienation right up until its strange and unforgettable ending. This sort of film just isn't made any more.